February 2017 Newsletter – Did you know? The Pantry is a hub of self-sufficiency services for our guests | Dulles South Food Pantry, Inc. February 2017 Newsletter – Did you know? The Pantry is a hub of self-sufficiency services for our guests – Dulles South Food Pantry, Inc. The Pantry has developed key local partnerships that offer important services to help our guests on their journey to self-sufficiency. 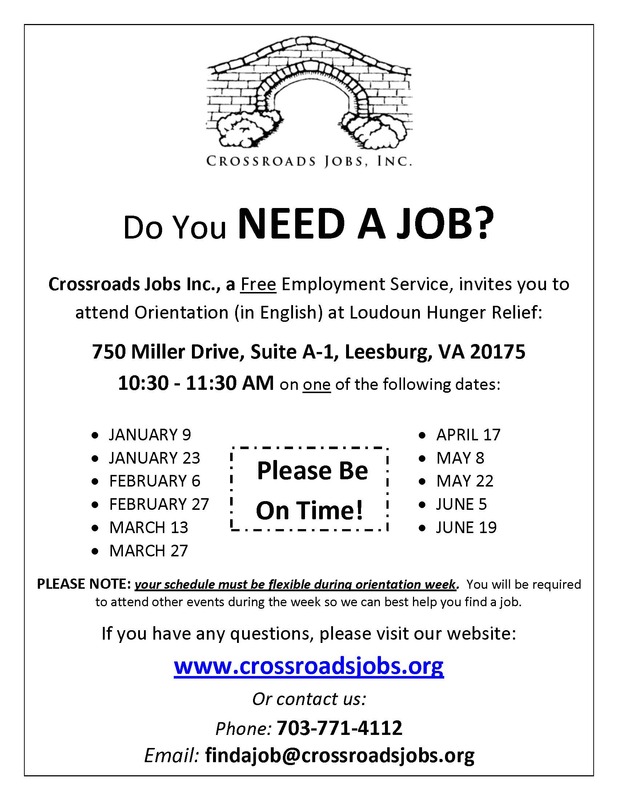 Crossroads Jobs helps area residents to find jobs to earn living wages in Loudoun County. The only free job placement service of its type in the County, Crossroads offers a comprehensive process—from orientation to placement—with resume and interviewing workshops, job search services, and interview coordination with candidate and employer follow-ups. Check out this flyer for upcoming orientation dates. Some of the sessions are held in the chapel at Arcola UMC where the Pantry is located. You can get more information about Crossroads here. The Mobile Hope bus travels to several Loudoun County locations each month and offers clients medical and dental care referrals, housing referrals, and clothing distributions. At the Pantry’s January 18th distribution, Mobile Hope served over 80 guests, giving out winter coats and boots. We are so thankful to have them visit the Pantry on a regular basis. They will return to the Pantry on March 15th at 5:00 pm. For more information about Mobile Hope, see their website at: www.mobilehopeloudoun.org. Computer CORE visits the Pantry to share information with our guests about their classes on basic computer skills. Adults over 18 can learn Microsoft Office 2010 as well as skills to find job openings online and write resumes and cover letters. Classes meet twice per week for three hours each from February to June (~20 weeks) at Herndon UMC, at Connections for Hope in Herndon, at INMED in Sterling, and in five other locations in Fairfax County. Check out this flyer for information about upcoming sessions. Visit Computer CORE online at: www.computercore.org.